“I am here because I haven’t seen any stars in Delhi,” a simple statement from Parth Joshi, one of the delegates who attended Delhi Youth Summit on Climate, 2010, gave an in-depth meaning to the summit’s aim and objective. To be a ‘change’ in the context of utilizing existing awareness and knowledge on environmental issues of Delhi was the foundation, based on which the two days youth summit was conducted. Another delegate, Nishant Bhaskar, Asst. Manager with Maruti Suzuki, shared his general interest on environmental issue. He said, “I am here because of personal reason. I am really passionate about the green cause. In fact, I dream of starting my own venture few years down the line. As of now, I want to understand what’s being done in Delhi to address the environmental problems. I would like to promote awareness about these issues among my colleagues and try to hasten the process of launching greener cars…”. Gathering concerned citizens and giving them the platform to discuss different environmental issues that the city and the nation as a whole are facing, and to come up with action driven solutions was the main objective of calling such youth summit. Delhi Greens extends a heartfelt thanks to all the speakers and young people across different fields that came and made the summit a success with their sharing and expertise. Our special thanks to Dr. Chirashree Ghosh, Dr. B. C. Sabata, Gaurav Gupta, Madan Mohan Bajaj, Dunu Roy, Jaimala Iyer, R.K Srinivasan, Shashi Pandit, Anuradha Shukla, Nimisha Garg, and Ajay Mahajan. We will like to acknowledge the support and contributions of young people like Deya Roy, Manish Shrivastav, Debadityo Sinha, Khuraijam Jibankumar and Samraj Sahay who led the delegates in different groups and guided them through various issues on the six topics. Wholehearted thanks goes to the four Green ambassadors who challenged the youth with their lives that speaks for them and their struggles which became an inspiration to all. Ajit Sheshadri, Anadish Pal, Debadityo Sinha and Jibankumar, kudos to all of you! Besides the speakers and people who took the summit through meaningful discussion, Delhi greens extend its thanks to Ryan International School, Mayur Vihar for their powerful play performance on climate Change. Others that definitely come on our thanking list will be Manu Sharma and Shibayan Raha. Last but not the least, very special thanks go to our supporting organizations without whom the summit would not have been materialized. Thanks to NMML (Nehru Memorial Museum & Library) and Oxfam India! The last day saw Delhi Greens presenting its line of action and projects for which delegates were given the option to join whichever project they wanted. Mainly seven projects were highlighted – Save tree Campaign: Ped Lagao, Ped Bachao, A project on the projects of Yamuna, Dressing the Delhi Ridge Green, Carry the right responsibility and not poly (bags), Riding towards Healthy City, Walk-ability in the city, Climate change & urban poor. The last project got the highest number of people interested in participation. Around twenty delegates volunteered and pledged to join hands and work on ‘climate change and urban poor’. The challenge has been taken up and the fight will go on to achieve what the two days summit purposes to live out. 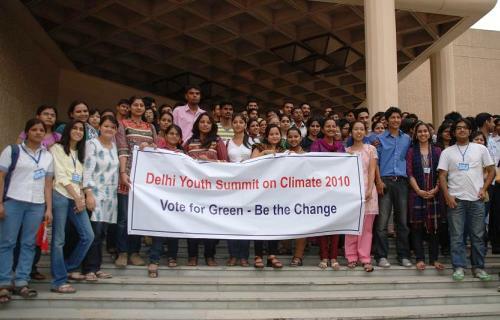 :: Delhi Greens :: » “To Be the Change”…that’s what DYSoC 2010 Delegates Pledged For!